This is the Ultimate Mattress Pad of all time. No more hot flashes! No more night sweats! No more cold winter nights! No more uncomfortable hot humid summers! Our mattress pad is the only one that can provide relief from numerous medical conditions without side effects. Because there are no wires in the mattress pad, there is no electrical field in your bed. 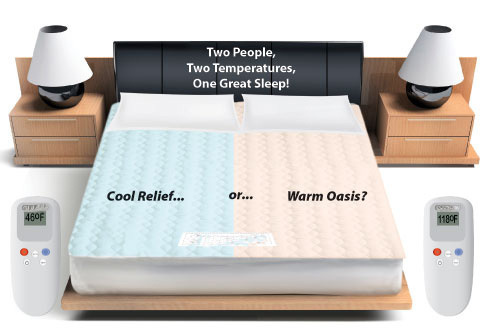 Not only will the Ultimate Mattress pad warm your sleep surface, but it will also cool it. This unique feature allows you and your sleeping partner to individually adjust the mattress temperature on either side of the bed to your preference with dual, wireless hand-held remote controls (see illustration above). The temperature range is from 46°F to 118°F. This is made possible by two circulation motors, which have about the same sound level as a quiet air conditioner or a small aquarium pump. 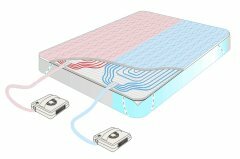 The motors circulate water throughout the mattress pad through undetectable (spaghetti thin), puncture-proof, medical grade, silicone tubing. The circulation motors use only 100 watts when cooling and 150 watts when heating - the same as a light bulb. They also have a programmable sleep timer. The polyester filled, Poly/Cotton mattress pad fabric is machine washable, and will fit any size and type of mattress. Two year warranty. Available in Single Zone (1 motor, 1 remote) in Twin, Twin XL, Full and Queen size, or Dual Zone (2 motors, 2 remotes) in Queen, King, and California King size.